Daffodils come up in an unused vegetable garden on my dogwalking route. Every year I think: I should climb over the wall and steal them. I should remember where they are and steal the bulbs, later. But I never have. The wall is only two feet high, but the weeds on the other side are uneven, hide holes. And I have bad knees, bad ankles, and an impatiently tugging animal on a lead in one hand. One year they vanished just after I spotted them. Somebody else stole them. So this time, in my high topped boots, I carefully sat on the wall and lifted my feet over, got out my knife and cut a dozen daffodils. Like the ones we always took to the cemetery–a long drive away–in America, for Mama. 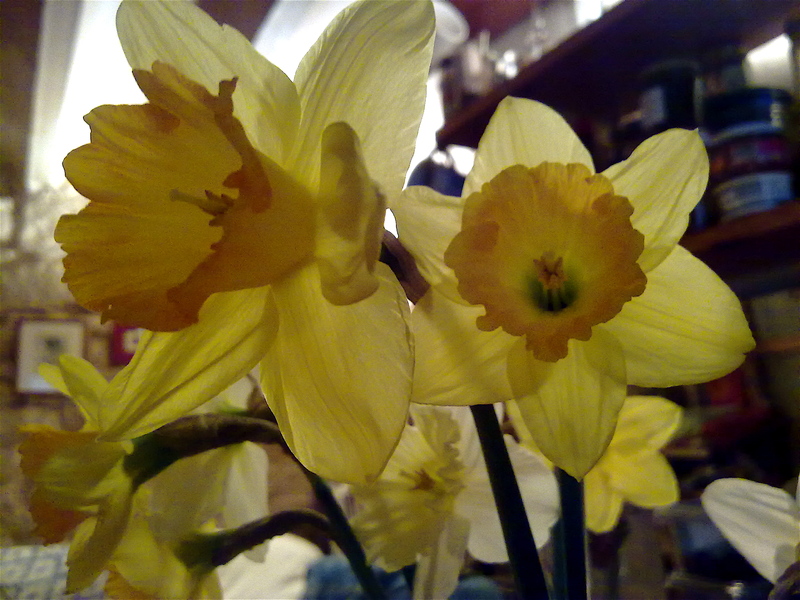 So for the first time, we have daffodils in this house. 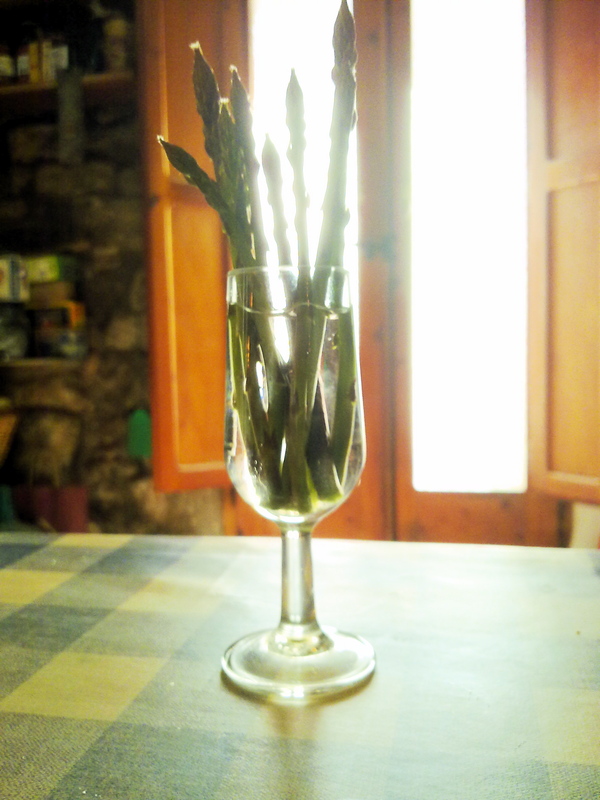 Then, K came in from his round of dogwalking with the first wild asparagus/espàrrecs de marge/esparrágos trigueros. So we began the March/April/May tradition of having asparagus as a first course on alternate days, beginning with a revoltillo which is unfortunately not very photogenic. 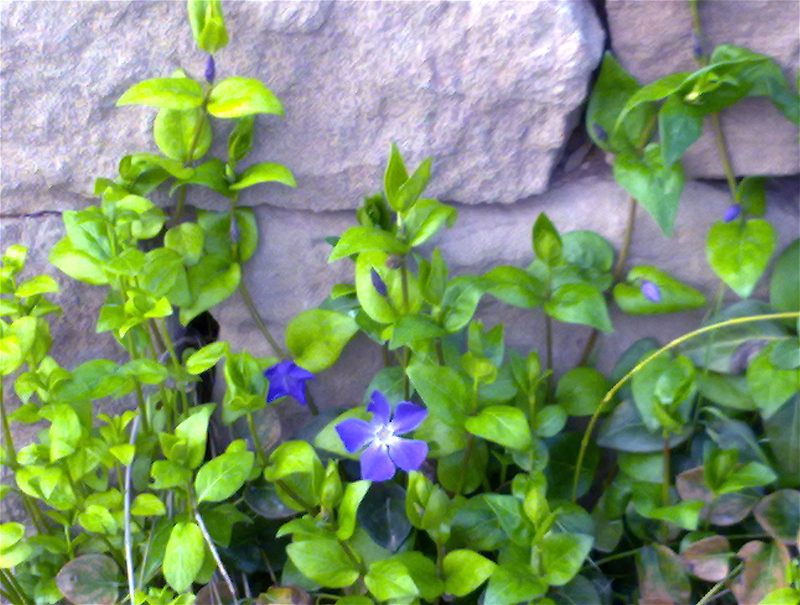 The first periwinkles. A crayola blue. I used to think these were clematis. Perhaps I am still doubtful. But they are beautiful and mean Spring to me. 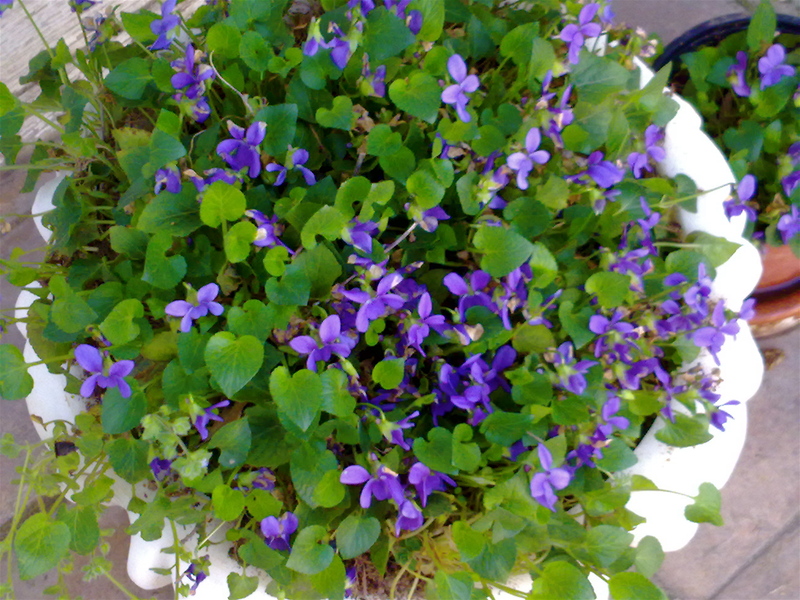 Wood violets, carefully coddled in the shade on the roof terrace. K thought I should have some. Or else he just wanted them himself. They are so beautiful. Found wild all around. I have been trying to photograph these. I have no camera since I fell on mine trying to prevent my dogs savaging a feral kitten (yes on the lead. Ruskin pulled me over). So I only have my ‘phone to photograph with. They are so small, and so delicately painted. I didn’t know what they were. I picked one and brought it home for K to try with his camera, and he said “What is it?” and I said “I don’t know. Maybe it’s a ‘bird’s-eye’?”. 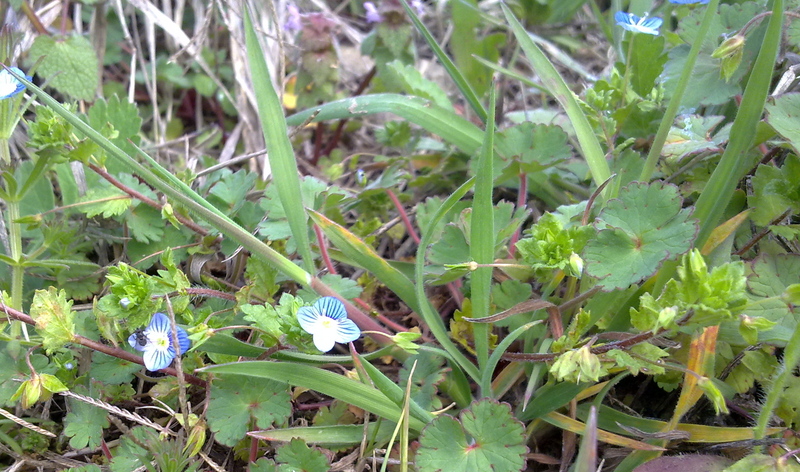 Because it isn’t perfectly easy to google “small blue flower”. But I googled “bird’s-eye” and apparently it is. Where do such bits of information come from, and get into the brain? 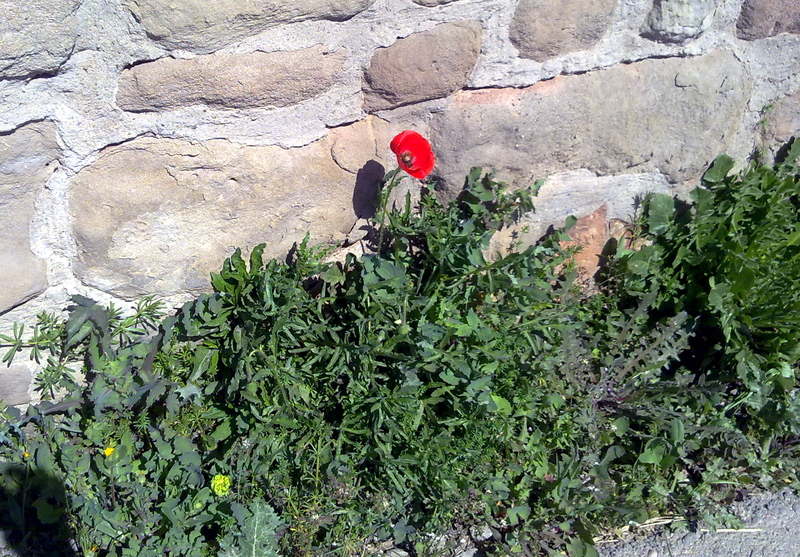 And the first poppy. All by itself behind the cemetery. Brave! So it must be Spring. The ‘phone cannot photograph things that move fast (or the ‘phone user can’t). The first swallows/orenetes/hirondelles de la cheminée arrived slightly early (as spotted by me) on the 20th of March. They are really very punctual. And I have seen hoopoes as well as hearing them. I do take out the ‘phone and point’n’click* at these, but only some blurs are visible. We’ll leave the bad news for later. *Ha ha: I very carefully got out the Special Characters palette and put apostrophes where I wanted apostrophes and single quotes where I wanted single quotes, but Mr WordPress has his own ideas. Mea culpa, typographers of the world.